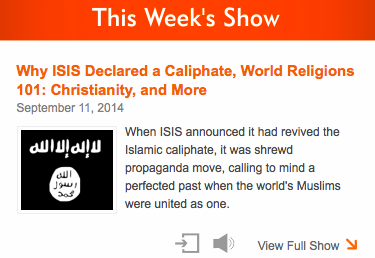 Fiedler: Now, in the Muslim tradition, the words caliph and caliphate are really important. What do they mean, Reza? If you’re not listening carefully you probably wouldn’t make much of the move Aslan just made there, one familiar to any world religions textbook reader; but a spoonful of critical thinking might make evident that the issue of meaning today was addressed in terms of origins and orthodoxy — apparently, we need to establish a timeless anchor by means of which to judge how we use words today. For to the question, “What do these words mean” — posed in the context of a group using the words right now, in the year 2014 — the answer took us back 1500 years and told an orthodox origins tale. There is much going on in this answer (let alone throughout the rest of the interview [posted below]); what should at least be apparent to a careful listener is that Aslan is here using a normative tale as the set-up to delegitimize how the term is being used now by representatives of the Islamic State — for we now know that the term “has never ever” been used in the way that we now hear it being used (well…, apart from that one time), and thus this use is outside the tradition and, obviously, wrong. Now, I’m not going to say anything about Fiedler’s troublesome notion of some homogenous thing moving through time called “the Muslim tradition,” and I’m not going to say anything about Aslan’s terribly anachronistic (and thus self-serving) use of the taxonomy political vs. religious (as if these two concepts name stable, distinguishable, transcendent identities); instead, I simply wish to point out the way listeners are being told that a specific situation today, with which many of us surely disagree, is being portrayed as deviant by means of the structure of this answer — a portrait that authorizes our disapproval and simultaneously allows listeners to be able to identify correct practitioners (those who use the word this way) as different from, I suppose, radicals who have perverted the message (and thus use the word that way). For current usage is being judged by its relation to what is seen as a normative point in the past, read in a particular way, so as to normalize one present (by portraying it as part of that thing called tradition or the community or “the worldwide body of faith,” as Aslan translates the Arabic ummah) while abnormalizing another (by portraying it as a deviation or anomaly, calling them upstarts and amateurs, as Aslan puts it later in the interview). It’s fascinating how name-calling is fair game if we, as scholars, disagree with a position we happen to be studying. Contrary to this, it has always struck me that the challenge of being a scholar, regardless to whom you’re speaking, is to take all forms of human behavior seriously when studying them — especially those with which you may happen to disapprove personally. For the issue for scholars ought not to be whether some group is right or not but, instead, to understand how anyone can come to see themselves, their words, and their actions as correct, as persuasive, as meaningful, and, in this some cases, as worth killing and dying for. Listen for yourself and see what you think of how hard scholars sometimes work to ensure that the public understands the right and wrong way to be a religious person — not surprising, really, given the title of the show, right? This entry was posted in Faculty Blog, Relevance of Humanities, Religion in Culture and tagged Deviation, Interfaith Voices, Islamic State, Maureen Fiedler, Orthodoxy, Radicalism, Representation, Reza Aslan by Russell McCutcheon. Bookmark the permalink.